Which are best performing funds in the financial year 2017? Before answering this question let’s take a look at stock market performance. A financial year 2017 was one of the best year for the stock market investors. BSE sensex rose 18% in FY 2017. Lot of stocks has turned out to be multibagger stocks in FY 2017. In addition to that lot of funds has also given exceptionally high return to investor in FY 2017. Chasing stocks is a difficult task especially if you are doing full time job. Hence, better alternative of stock market is mutual funds. If you are thinking that mutual funds cannot perform here are 10 best performing funds that gave 60% return last year. The first best performing fund is DSP BlackRock Natural Resource and New energy fund.DSP BlackRock Natural Resources and New Energy Fund is thematic – infrastructure fund. This fund has given 60% return to the investor in last one year. Historically also this fund has given very good return to the investor. ICICI Prudential Banking & Financial Services is second best performing fund of FY 2017. In last Year this fund has given 53.7% return to the investor. It is a sectorial banking finance fund. This fund is yet not ranked by CRISIL. A historical performance of this fund is very good. The third best performing fund is also sectorial fund – SBI Magnum Comma Fund. SBI Magnum Comma Fund has given 51% return to the investor in last year. It is high risk fund. A historical performance of this fund is also very good. 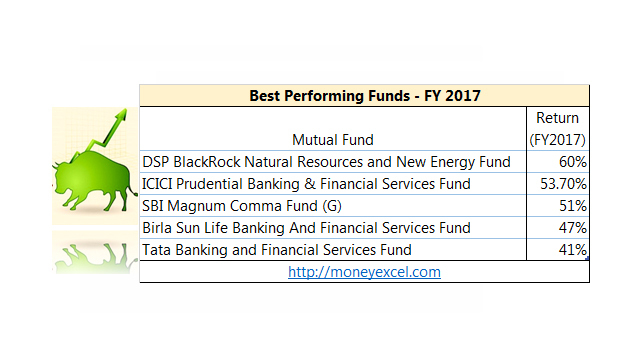 The next best performing fund in the list is Birla Sun Life Banking and Financial Services Fund. This fund has given 47% return to the investor in last year. As it is sectorial fund of banking and financial industry performance of this fund depends on all banking and finance stocks where a fund has invested the money. Also Read – How to Switch from Regular Mutual Fund to Direct Mutual Fund? The last best performing fund in the list is also sectorial fund from banking and finance sector. This fund has given 41% return to the investor last year. As it is newly launched fund historical performance detail of fund is not available. Should you invest in the Fund mentioned above? All mutual funds mentioned above are either thematic or sectorial fund. The return of these funds always depends on sectors where money is parked. The risk associated with these type of fund is very high. If you are risk adverse investor with the conservative view, you should not invest in any fund mentioned above. The better option for you is either debt fund or balance fund. If your risk taking capacity is high and if you have surplus money you can invest in the fund mentioned above. « How to Link Aadhaar with PAN for Income Tax E-filing?